Thomas Chipperfield on the cover of The Telegraph Magazine. As many know from our recent blog, the Scottish government is planning to introduce a bill to ban performing animals in travelling circuses. Below we reproduce a letter from Thomas Chipperfield who is the UK's only current big cat trainer working in a travelling circus. This is a copy of a letter he has sent to the Scottish; Environment, Climate Change and Land Reform Committee. We are grateful to Thomas Chipperfield for allowing us to reproduce it here. I am writing with the intention to submit evidence that not only supports the use of wild animals in travelling circuses but also condemns the idea of a ban on such a practice. First and foremost, I wish to highlight some inaccuracies that I have read in the WILD ANIMALS IN TRAVELLING CIRCUSES (SCOTLAND) BILL. "In terms of wider applicability, due to the lack of scientific data on the welfare requirements of wild animals within the travelling circus environment, and the difficulty in gathering such information for the range of species potentially involved, such a scheme is unlikely to be able to ensure best welfare for each and every possible travelling circus wild animal species"
The author of this bill is clearly unaware of the works of Dr Marthe Kiley-Worthington, who was commissioned by the RSPCA to conduct the first scientific study of British circus animals, Professor Ted Friend of the Texas A & M University, who studies involved tigers and elephants on American Circuses and Dr Emmanuel Birmelin, who conducted stress tests on German circus lions in transit. All of the works from the above mentioned scientists can be provided upon request. "There are no travelling circuses with wild animals based in Scotland and only two have visited in the last eight years. Such a mechanism would require a disproportionate resource to implement, monitor and enforce in Scotland"
Firstly, being that in England all applicants and licence holders pay administration and veterinary fees, so the taxpayer is not liable for the cost of licensing. Secondly, I have not found the estimated cost of implementing the proposed bill. "Setting up a regulatory mechanism to allow the continued use of wild animals in travelling animals in travelling circuses would completely fail to address the ethical concerns raised in response to the Scottish consultation in 2014." The first is one of welfare, which licencing would address. The second is that a nonhuman animal has the right to liberty, as this bill discriminates between wild and domestic groups by advocating that right for the former but not the latter. To close on page 3, whilst the Welsh Assembly worked with Professor Stephen Harris on this matter, this individual was proven to have financial links to animal rights groups in a court of law, calling into question his credibility as an impartial expert. This criticism was officially made by several different stakeholders prior to the commencement of his scientific investigation. "The use (performance, display or exhibition) of wild animals whose nature (telos) is still genetically and behaviourally hardwired to be expressed in their natural, wild environment"
Non-native, non-domesticated species are being farmed in the UK in their thousands, yet the Scottish Government doesn't see this as a problem. Also, there is a welfare element in this statement which contradicts the purpose of the bill to pursue a ban on ethical grounds. "The performance of tricks generally not normally seen naturally, in an artificial environment for the entertainment of the viewing public"
This is a fiction of the animal rights movement. Tricks typically performed by circus tigers and lions, to give but two examples, include rolling over, sitting up, jumping and variations of the above. All of which are completely natural actions. The argument over whether or its environment is “artificial” is irrelevant. It is arguable that any captive animal lives in an artificial environment. Furthermore, this is another welfare based argument, which doesn't belong in this bill. "The keeping of animals in temporary and/or mobile animal accommodation that cannot generally provide the sizeable and complex living conditions that many wild animals require to carry out behaviours or functions according to their natures (telos)"
Neither can zoos nor the above mentioned farms, yet this is not seen as a problem by the Scottish Government, if that point were even true. In fact, it has been proven that circus animals are able to demonstrate a large number of natural behaviours in their environment (see academic references at the start of this letter). This is yet another welfare-based argument which does not fit with the purpose of this bill. "A significant proportion of time travelling from one site to another, further significantly curtailing the ability of wild animals to undertake their natural and instinctive activities"
Another animal rights propaganda quote. It seems that no research has been carried out in to how long British circus animals typically spend in transit, as it is usually less than 2 hours of every week. "Little or no education or conservation value, and no significant benefit other than maintaining a tradition considered by the majority to be outdated and morally wrong." This is another almost entirely inaccurate statement. British circuses almost always include an educational element, if not in their presentations then after the show, in their "zoos" where the public can see where the animals live, often at feeding time. Also, speaking from my experience as an animal trainer, I have been approached by a number of students who have wanted me to lend my expertise to aid them in school projects. Examples of such can be provided upon request. Also, out of a population of 5.3 million, only approximately 1,000 Scottish residents responded to the public consultation relevant to this matter. It is also worth noting that, due to the fact that so few circuses tour Scotland, with or without animals, they are unable to reach a wide audience to appeal for support or even raise awareness about the existence of the above public consultation. Animal rights groups, on the other hand, operate as businesses and therefore are able to devote time and resources to rallying support of their own, and fact that so few even responded in favour of a ban demonstrates how little public support there is for one. To add to the above, myself and my business partner, Anthony Beckwith, were able to gain as many petition signatures from residents local to Fraserburgh, Aberdeenshire, in 3 days, without even operating as an open business. In paragraph 23 it states that circuses which use wild animals promote a lack of respect for said animals, when nothing could be further from the truth. Almost, if not absolutely every circus in the Western World promotes and advocates good animal welfare. Besides from being illegal, circuses are at the forefront of criticism and therefore promoting anything other than good care of animals would simply be bad PR. "Wild animals in travelling circuses are generally kept for long periods in temporary, mobile and, by necessity, relatively barren accommodation (for example indoor facilities may simply be the waggon in which they are transported, outdoor paddocks may be limited in size by the site available to the circus and security concerns, and environmental enrichment may be limited by time constraints and space factors)." The above quote is nothing but generalisation after generalisation and a complete non sequitur, considering that a regulatory system would ensure that indoor housing has enrichment, and outdoor enclosures/paddocks are of sufficient size and all enclosures and venues are safe. With that in mind, I really cannot stress enough how asinine the statement about paddock sizes being limited to the size of the available site is. To the best of my knowledge, I have covered all of the major issues with the bill, and would now like to provide some moral arguments for the use of wild animals in travelling circuses. 1. As has been previously stated, almost all, if not every circus that features animals, either wild or domestic, advocates and encourages good animal welfare. If nothing else, this message is good for business as the general public enjoy watching well looked after animals engaging in activities. 2. Circuses with animals are supporters of and engage in animal rescuing and rehoming. All of the animals in Marilyn Chipperfield's dog act came from rescue shelters or were given to her by friends; none had been purchased from breeders. The same can be said about the cat act which featured in Zippos Circus in 2016. This doesn't mean that this practice is limited to domesticated species', as Tommy Chipperfield's alligators were obtained from farms in the United States which breed these animals for leather. He also took in a number of pythons and anacondas over the years that were given to him by owners who were no longer able to provide a suitable home for them, due to their increased size. The same has been done by circus trainers with parrots and various other non-domesticated animals over the years. 3. This also may have been said already, but circuses with wild animals almost always provide an educational element, if not in the show, then when the "zoo" is open to the public. Here experienced keepers and the trainers are free to talk and answer questions from the visitors. Also, a number of circuses, including some which I have worked for, have staged educational presentations for school and University students and I myself have been approached to give lectures at Universities and to offer assistance with a number of students' assignments. 4. Circuses with wild animals inspire people to care about the wild. Audiences are amazed by the agility and intelligence displayed by trained circus animals, and feel very strongly about them softer seeing them with their own eyes. "The question is, are we happy to suppose that our grandchildren may never be able to see an elephant except in a picture book?" It is far than a stretch to assume that this is a statement which backs up my own, made previously. Also, Steve Irwin publicly supported Seaworld, claiming that children watching dolphins performing inspired them to care about their wild cousins. In my own personal experiences, I have had a number of University students approach me to ask what the best route is to engage in conservation, which I was able to advise on. 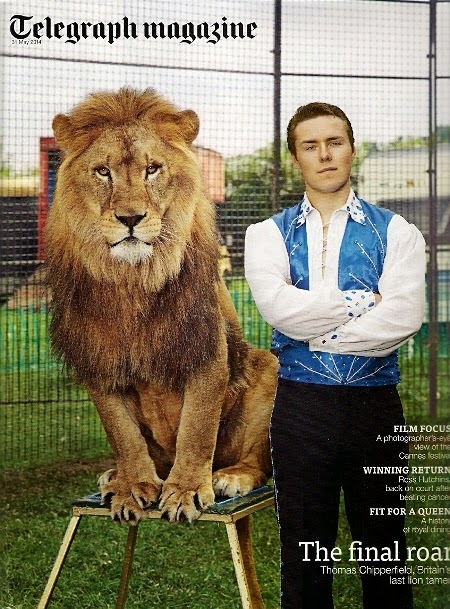 Scottish Circus Animal Ban: Questionable Ethics? Scottish ban on wild animals in circuses. Is it really ethical?